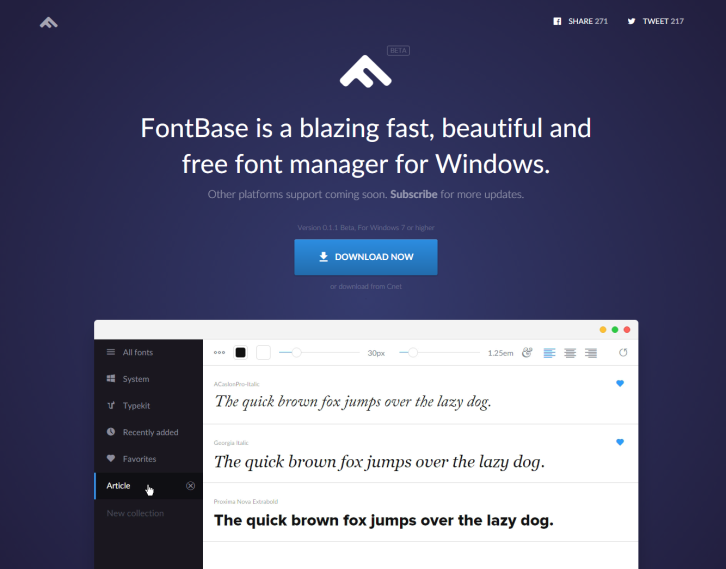 FontBase is a blazing fast, beautiful and free font manager for Windows. There is a number of predefined collections, such as recently added fonts (really useful), Typekit fonts and favorites. You can also create as many collections as you like by yourself. Simply change the color, background, font size, line height and align of your fonts. Apply styles to the whole collection or just to individually selected fonts. Tired of scrolling up and down when you need to compare two fonts? In FontBase, you can simply pin a font to top and easily compare it to any other font in your collection. They also support a broad number of OpenType features. That includes ligatures, tabular figures, super and subscript, swashes, old style figures and some more. You can be sure, you’ll always use the latest version of FontBase, because guess what? Automatic updates! No need to re-download. Ever. Great advice. I get more experience to the blog. Thanks for easily describe this. Looks pretty and runs fast, but does not actually manage fonts much. I was hoping for FontBase to be able to install, uninstall and read fonts from other folders than Windows’ Fonts folder. In other words, for this program to work you need to have your gazillion of typefaces already installed in the Fonts folder!